Corn Bin Double Compartment. 1200mm long x 640mm wide x 900mm high. Can hold up to 630 ltrs of feed. 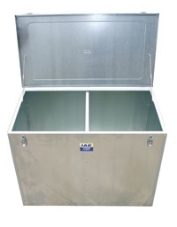 Also suitable for tack and tool storage with padlockable latches. Delivery charges for this product will depend on your location, quantity ordered and may be free. Please email for details.